Christie, Stuart. We, the Anarchists! 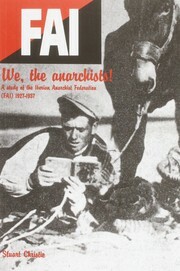 A Study of the Iberian Anarchist Federation . Christiebooks: 2002. 4 + 127 pages. History and analysis of the FAI from its roots in 1872 through to the end of the Spanish revolution in 1937. 9781901172065 Not currently available. Find at a local library.